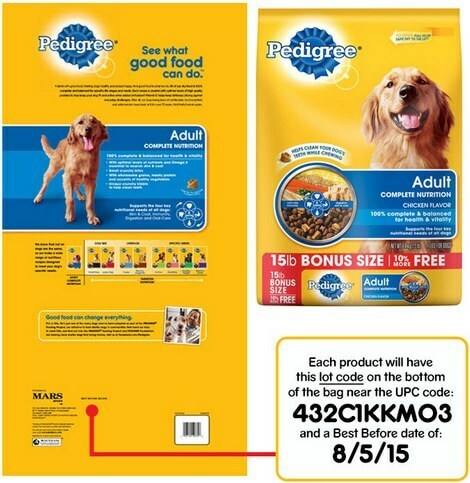 However, it now is being expanded to include 55-pound bags of Pedigree Adult Complete Nutrition dry dog food products sold in Sam’s Club in Indiana, Michigan and Ohio. 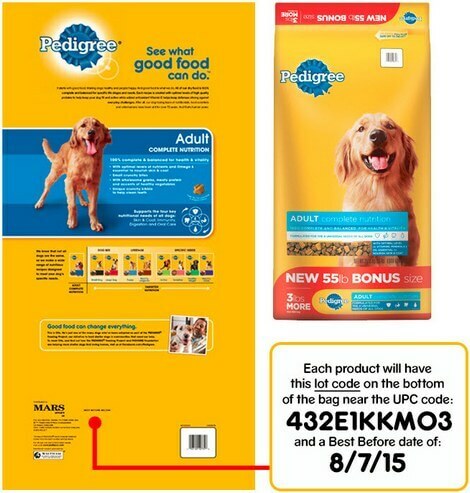 Pedigree Adult Complete Nutrition dry dog food in 15-pound bags sold at Dollar General stores will have the lot code 432C1KKM03 printed on the back of the bag near the UPC and a Best Before date of 8/5/15. The company has received no reports of injury or illness associated with the affected product. Consumers who have purchased the affected product are advised to discard the food or return it to the retailer for a full refund or exchange. Consumers may contact Mars Petcare at 800-305-5206 from 8:00 a.m. to 7:00 p.m. CST.